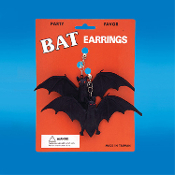 New CLIP-ON Giant-size BLACK Bat Earrings, each cello wrapped separately on costume jewelry back card for gift giving, Halloween True Blood premiere, or vampire gothic themed birthday party favors. Silver-tone metal CLIP earring jewelry findings. Wholesale prices for Gothic Halloween Haunted House Cosplay Costume Accessories, Party Favors or Store Giveaways! Twilight, New Moon, Eclipse, Vampire Diaries, Dracula, Elvira, Svengoolie witchy fans will go batty over these!!! Each dimensional black toy rubbery plastic charm bat wingspread is approx. 5-1/2-inch (13.75cm) wide x 2-inch (5cm) high x 5/8-inch (1.56cm) deep.